Changsha -- Zhou Qiang was re-elected as governor of Hunan Province and Zhang Chunxian as provincial top legislator on Thursday at a session of the provincial legislature. 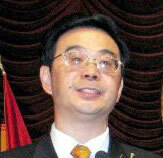 Zhou, born in 1960 in Hubei Province, has been the provincial governor since February 2007. Before the Hunan post, he was the first secretary of the Secretariat of the Central Committee of China's Communist Youth League. Zhang Chunxian, also Communist Party chief of Hunan, was re-elected chairman of the Standing Committee of the Hunan Provincial People's Congress, the provincial legislative body, at the first session of the 11th Hunan Provincial People's Congress. Born in 1953 in central Henan Province, Zhang was elected as the provincial Party chief in November 2006. Before coming to Hunan, Zhang was the country's Minister of Communications.